How Can I Optimize for ‘Near Me’ Searches? With voice-search technology becoming more and more prevalent in today’s web search landscape, we are seeing a lot more people searching for services ‘near me’ instead of targeting a specific location. The ‘near me’ search has increased by over double in the last year alone and about 15 times more compared to 2013, so what does this mean for local businesses? It means that it is important for a local business to optimize for these ‘near me’ searches. Below are a few tips you can do to increase the overall friendliness of your site when it comes to near me searches. 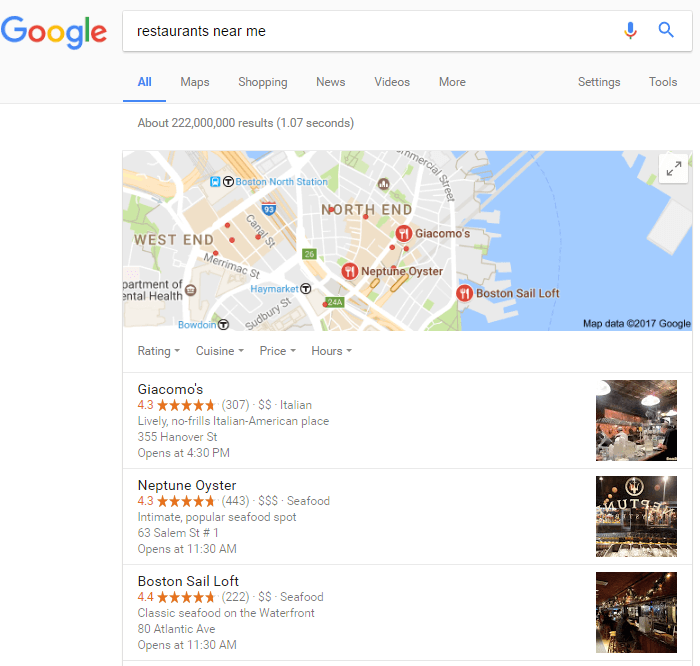 Set up local business listings- With business reviews becoming more and more of a key factor that google uses when considering rankings, it’s important that you are listed on review sites. This is crucial for Google’s local search algorithm, and will be more important in upcoming years as well. Local links are key- If you can get links from local sites such as events, directories, news sites, schools & colleges in your area and other non-competing companies that you may partner with this can greatly increase your chances to rank better in ‘near me’ based searches. Sprinkle in ‘near me’ in your copy- If you can find a way to add ‘near me’ to some of your content it will help you get found easier for this search term. But remember, don’t jam it in your content in an unnecessary fashion that doesn’t sound organic, that’s a good way to hurt your rankings rather than help. So, channel your inner Hemmingway and make your copy sound cohesive. Be useful & quick- Most of the traffic that comes from ‘near me’ inquiry’s will most likely be mobile for obvious reasons. Since the user is probably on the go you are going to want to be quick and useful when providing info to potential customers. This means providing relevant content to the specific keywords you are targeting, and quickly answering what the customer may have a question for. It is also important to have everything on your site optimized well for mobile.